Your concerns are important to us and we regret to hear your story. Our records show that we have spoken to you in regards to this matter and consider this addressed. 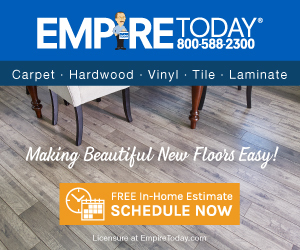 For future inquiries please contact customersupport@empiretoday.com. We have read your review and are disappointed to hear that you are experiencing this problem. We understand that we have been in contact with you regarding this matter and will continue to investigate further in attempt to reach a solution. CONTINUE TO INVESTIGATE , HUH?..IF THAT WERE TRUE, YOUR EMPIRE WOULD HAVE SENT SOMEONE HERE WITH, HECK, ORDINARY VISION WOULD DO.....AND COMMON SENSE...TO "INVESTIGATE" THIS COMPLAINT BY NOW...BUT MS. NO ANSWERING THE PHONE IN "CUSTOMER SERVICE" SAID NO, EMPIRE WILL NOT SEND ANYONE TO LOOK AT THE PROBLEM JUST BLATHER THERE, I MUST SUPPOSE... DAY 4 UPDATE WITH ANTI EMPIRE BS 8/21/16..12:54 AM....ANOTHER DAY, BARELY MAKING A DENT, ORIGINAL OBSERVATIONS OF THE LARGE NUMBER OF PESTS OCCUPYING THIS CARPET WERE BASED ON MY FAMILIARITY WITH THIS KIND OF THING...LONG AGO, RENTING APARTMENTS IN OLDER BUILDINGS, THE ROACH POPULATIONS SEEMED ALWAYS CONSISTENT THAT THE PESTS WERE ALWAYS THERE, NOT HARD TO FIND.… THIS SITUATION BORDERS ON UNBELIEVABLE !...I DO NOT THINK THAT THE TAINTING OF THIS PRODUCT WAS DELIBERATE ON THE PART OF EMPIRE TODAY....BUT IT IS UNDENIABLY THEIR RESPONSIBILITY BECAUSE OF THE NUMBERS.....BECAUSE NO HABITATION/INFESTATION EXISTS ANYWHERE....ANYWHERE IN MY HOME..OTHER THAN THIS ROOM THAT EMPIRE INSTALLED THIS CARPET IN....THE MASTER BEDROOM......OF MY HOME THAT IS FOR SALE....THAT, IN MY OWN GOOD CONSCIENCE, I CANNOT EVEN HAVE IT REMAIN TO BE SHOWN; UNTIL THIS TRAVESTY IS CORRECTED..SO I SUBMIT THERE IS ABSOLUTELY NO MERIT IN ANYTHING THAT EMPIRE TODAY ENTERED AS COMMENT TO MY ORIGINAL POSTING....THEY DID NOT CONTACT ME FROM CUSTOMER SERVICE OR ANYONE OTHER THAN THE AUTO-CALL TO CONFIRM SALES BOY ON HIS WAY....I CONTACTED THEIR CUSTOMER SERVICE; MS. NO, WE WON'T/NO WE DON'T/THOSE ROACHES DID NOT COME WITH THEIR CARPET,...SHE KNOWS "NO" & HOW TO READ QUESTIONS FROM A SHEET...THAT'S ABOUT IT....… THEY PURPORTED THAT THEY ARE FURTHER INVESTIGATING THIS SITUATION....I SUBMIT THAT IF THEY WERE TRULY DOING SO, THE FIRST THING THAT THEY SHOULD DO IS TO COME HERE AND SEE FOR THEMSELVES...SOMETHING I ASKED FOR THEM TO DO....MS.
NO SAID NO..(FOR THEIR OWN SAKE, THEY SHOULD BE SCRAMBLING TO THE WAREHOUSE THIS CARPET AND PAD HAD BEEN STORED IN TO SEE TO IT THEY NIP IT AT THE SOURCE, LEST FOLKS LIKE MYSELF ~ PAID CUSTOMERS THAT DISCOVER THEY HAVE PAID BIG DOLLARS TO INFEST THEIR PROPERTY / DAMAGE THEIR PROPERTY~START HOLLERING AND WANTING JUSTICE)...NO ONE SHOULD HAVE TO PAY THEIR HARD EARNED MONEY TO ATTEMPT TO BETTER THEIR CONDITIONS, THEN DISCOVER THEY HAVE BEEN VICTIMIZED BY THE LARGE UNCARING CORPORATION AND ONLY HARMED THEMSELVES PUTTING THEIR FAITH AND TRUST IN THE WRONG PLACE...IN THE WRONG PEOPLE. IF THEY WERE TRULY ATTEMPTING TO RESOLVE THE PROBLEM, THEY WOULD HAVE ALREADY AT LEAST COME TO THEIR JOB SITE WHERE THE TAINTED PRODUCTS WERE INSTALLED (MY CONTENTION) AND SEE FOR THEMSELVES IF THERE IS MERIT TO THIS CLAIM....TO THIS COMPLAINT.....THAT WOULD BE THE BARE MINIMUM OF A FIRST STEP ONCE THEY HAVE BEEN GIVEN THE INFORMATION OF THE COMPLAINT.....DON'T YOU THINK?. I STAND BY MY CONTENTION THAT EMPIRE TODAY TRIES TO PORTRAY THEMSELVES AS SOMETHING OF A SERVICE PROVIDER WHO CARES ABOUT THEIR CUSTOMERS AND THEIR OWN REPUTATION.....WHEN IT IS NOT SUPPORTED BY THE FACTS OR THEIR ACTIONS. THEY NEED TO SEE THIS CARPET BEFORE I FINALLY HAVE TO REMOVE IT .....IT WOULD BE APPROPRIATE TO INSTALL IT AT THE HOME OF THE SAD EXCUSE OF A CUSTOMER SERVICE MANAGER....THEIR BEDROOM PERHAPS, MAYBE THEIR CHILDS' BEDROOM. THERE WOULD PERHAPS BE A RAPID RESOLUTION TO THE PROBLEM THEN, I WOULD BET......THEN AGAIN....COME TO THINK OF IT, MAYBE NOT. JAN OR FEB 2016 PREPARING TO SELL MY HOME OF 31 YEARS AND REPLACED 10 YR. OLD CARPET IN BEDROOM THAT WAS ADDED 2006.MY HOME WAS PEST FREE DUE TO DILIGENCE IN WHOLE HOUSE TREATMENT FOR PEST EXTERMINATION/PREVENTION OVER ALL THESE YEARS. I CONTRACTED WITH EMPIRE TO DO THE WORK INSTALLING NEW CARPET AND PAD...$ 900 FOR 450 SF....ALLEGEDLY 1/2 PRICE AND UNTIL LATE IN JULY, I HAD CONSIDERED THE JOB TO HAVE BEEN SATISFACTORILY INSTALLED, WHEN I DISCOVERED THAT THE ENTIRE AREA OF THE CARPET WAS/IS SATURATED WITH TINY AMERICAN ROACHES,( EXTERMINATOR IDENTIFIED PICTURES AS AMERICAN ROACHES AND IS CONSIDERED AN EXPERT )THESE ARE TINY, JUST HATCHED, MULTITUDES OF ROACHES IN QUANTITY LIKE I HAD NEVER PREVIOUSLY WITNESSED IN ONE ROOM/LOCATION IN MY ENTIRE 60 YEARS OF LIVING. TO MAKE THE SITUATION WORSE, I HAD PLACED THE HOUSE FOR SALE IN THE REAL ESTATE MARKET AND NOW IT'S CONSIDERABLE EXPENSE, LABOR AND DELAY TO SELL UNTIL I HAVE RECTIFIED THE PROBLEM....BLIND SALESMAN, DAN, ACTUALLY TOLD HIS SUPERVISOR HE CAN'T SEE ANYTHING, HEAD THEM OFF AT THE GET GO WOMAN AT OTHER END OF THE CUSTOMER (HA HA) SERVICE NUMBER TOLD ME THAT THOSE ROACHES DID NOT COME FROM THEIR CARPET...NEVER MIND SHE HAS SEEN NEITHER...ALL I CAN DO IS REMEDY MY NEW DILEMMA AND BLOG ANTI-EMPIRE TODAY NEWS POSTS AS SATISFACTION FOR THIS TIME CONSUMING, EXPENSIVE PROBLEM THAT I NOW HAVE THAT I NEVER HAD DURING PRIOR 31 YEAR RESIDENCY .....I WILL BE SEEKING A REPLACEMENT FLOOR COVERING BUT CARPET FROM EMPIRE WILL NOT BE AN OPTION, IN FACT I'LL NEVER WANT CARPET AGAIN, AS I HAVE NEVER EXPERIENCED ANYTHING LIKE THIS IN ANY CARPET I HAVE LIVED ON ...EVER...WORDS OF ADVICE....AT EMPIRE TODAY...THE TERM 1/2 PRICE IS WITHOUT NORMAL MEANING, I MEAN...HALF PRICE OF WHAT ? SCENARIO WHEREBY I AM OUT $ 900 INITIAL COST, COST OF PROFESSIONAL GRADE BAYER PESTICIDES PRODUCT "DEFENSE", BORIC ACID, NEW VACUUM CLEANER....$300 +/-....SO, NOW EVEN MORE DOUBTFUL THAT EMPIRE TODAY WOULD DO THE RIGHT THING AND MAKE ME WHOLE; INSTEAD OPTING TO KEEP THE $ 900 THEY WERE PAID FOR THE PROPERTY DAMAGING DEFECTIVE CARPET I AM FORCED TO EXTERMINATE MYSELF TO PREVENT WHOLE HOUSE INFESTATION INSTEAD OF BEING ABLE TO RETURN TO MY NEW HOME IN FLORIDA TO CONTINUE WITH MY ONGOING WORK BEING DONE THERE...WHEREBY I AM OUT $ 900 INITIAL COST, COST OF PROFESSIONAL GRADE BAYER PESTICIDES PRODUCT "DEFENSE", BORIC ACID, NEW VACUUM CLEANER....$300 +/-....SO, NOW EVEN MORE DOUBTFUL THAT EMPIRE TODAY WOULD DO THE RIGHT THING AND MAKE ME WHOLE; INSTEAD OPTING TO KEEP THE $ 900 THEY WERE PAID FOR THE PROPERTY DAMAGING DEFECTIVE CARPET I AM FORCED TO EXTERMINATE MYSELF TO PREVENT WHOLE HOUSE INFESTATION INSTEAD OF BEING ABLE TO RETURN TO MY NEW HOME IN FLORIDA TO CONTINUE WITH MY ONGOING WORK BEING DONE THERE...THANKS EMPIRE TODAY...YOU COULD NOT HAVE SCREWED ME MUCH WORSE, YET THIS OUTCOME MIGHT HAVE ME EATING THOSE WORDS…..
Review #902724 is a subjective opinion of SIDWELLIAN. 1:57 AM 82016...SATURDAY...JUST FINISHED ALL I'M GOING TO DO FOR THIS NIGHT....EMPIRE TODAY...YES TODAY, SHOULD SEND SOMEONE TO SEE (INVESTIGATE FURTHER) THIS STATE OF INFESTATION IN THE CARPET THEY SOLD AND INSTALLED HERE BEFORE I LEAVE FOR FLORIDA LATER THIS AFTERNOON..EVEN AFTER MY EFFORTS, IT IS QUITE OBVIOUS THE EXTENT OF PEST OCCUPATION, AND I CAN TELL THEM AT THAT TIME WHAT WILL SOLVE THIS PROBLEM. (SOLUTION). THURSDAY & TODAY, I VACUUMED BEDROOM AND ENTIRE HOUSE ONCE TODAY AFTER CHECKING OUTSIDE OF BEDROOM WITH CARPET FOR ANY ESCAPEES. MOSTLY CONFINED TO CARPETED MASTER BEDROOM SO FAR. MEANWHILE, SHOWING THE HOUSE STILL ON HOLD, HOPE CAN RESUME AFTER TOMORROW MORNING INSPECTION BEFORE LEAVING TO HEAD BACK TO MY HOUSE IN FLORIDA. FOR THE RECORD , I CALLED THEM....ASKING FOR A CUSTOMER SERVICE REPRESENTATIVE WITH AT LEAST AVERAGE EYESIGHT TO COME SEE THEIR PRODUCT.....TO EXAMINE IT. THEN EXAMINE THE REST OF MY MOSTLY EMPTY OF FURNITURE HOME...APPLY THEIR VISION IN BOTH, ALL PLACES...SEE IF THEY COME TO SOME OTHER CONCLUSIVE SCENARIO OTHER THAN MY OBSERVED INFESTATION CONFINED EXCLUSIVELY TO THIS CARPET FURNISHED AND INSTALLED BY EMPIRE. I CALLED AGAIN TODAY (YESTERDAY) AND SPOKE WITH MS.
KNOW EVERYTHING HANGUP, ASKED AGAIN IF THEY WOULD SEND A CUSTOMER SERVICE REP.
TO SEE THIS SCENARIO FOR THEMSELF EVEN THOUGH I'VE SPENT MULTITUDES OF HOURS AND DAYS OF LABOR EXTERMINATING / VACUUMING AND ONLY DENTED THIS POPULATION THAT BLIND DAN CANNOT/COULD NOT SEE. SHE SAID NO...THEN INSTRUCTED ME TO GET AN EXTERMINATION COMPANY OUT.....I ASKED IF THAT WOULD BE DONE AT EMPIRE'S EXPENSE.....NO, SHE SAID! !